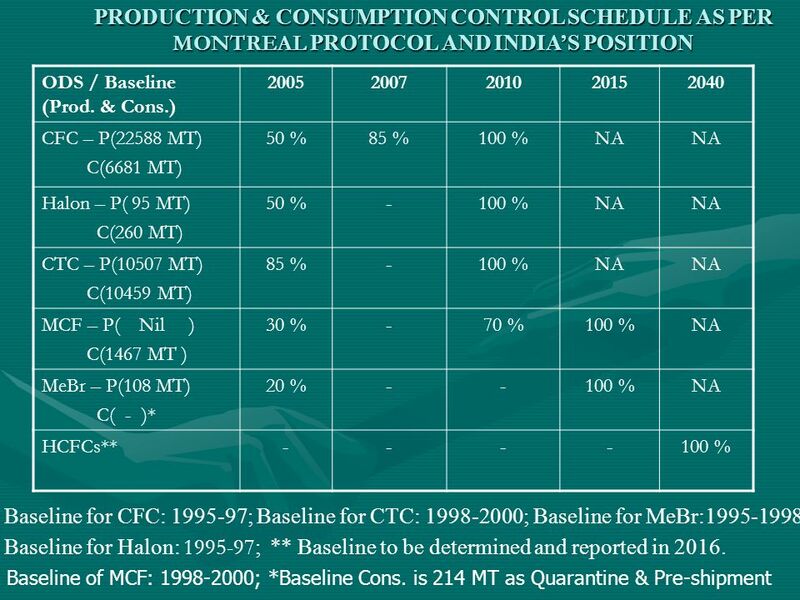 IMPLEMENTATION OF THE MONTREAL PROTOCOL IN INDIA & NATIONAL OBLIGATION AND COMMITMENT TO MONTREAL PROTOCOL. 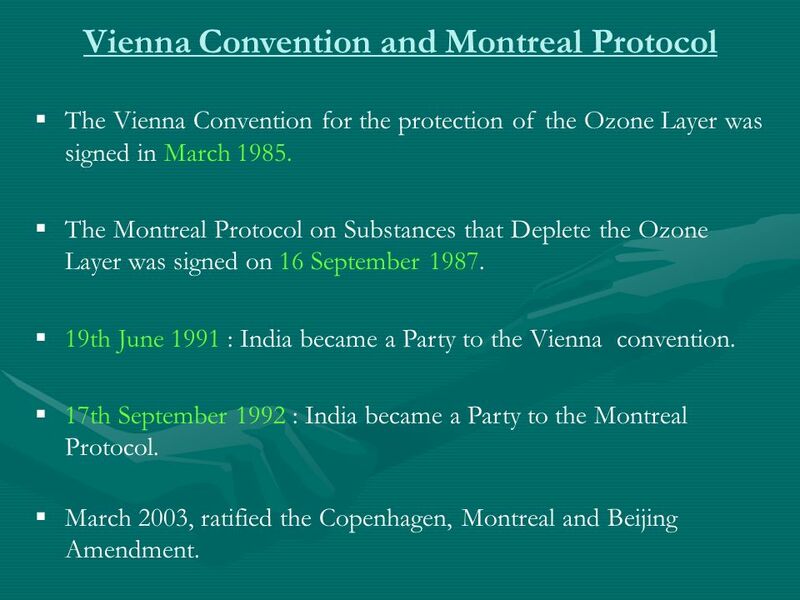 2 Vienna Convention and Montreal Protocol The Vienna Convention for the protection of the Ozone Layer was signed in March 1985. 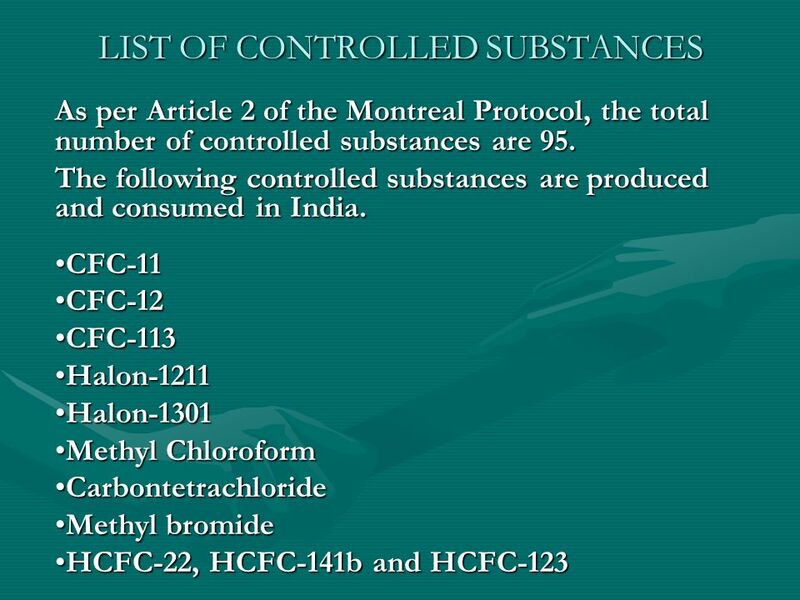 The Montreal Protocol on Substances that Deplete the Ozone Layer was signed on 16 September 1987. 19th June 1991 : India became a Party to the Vienna convention. 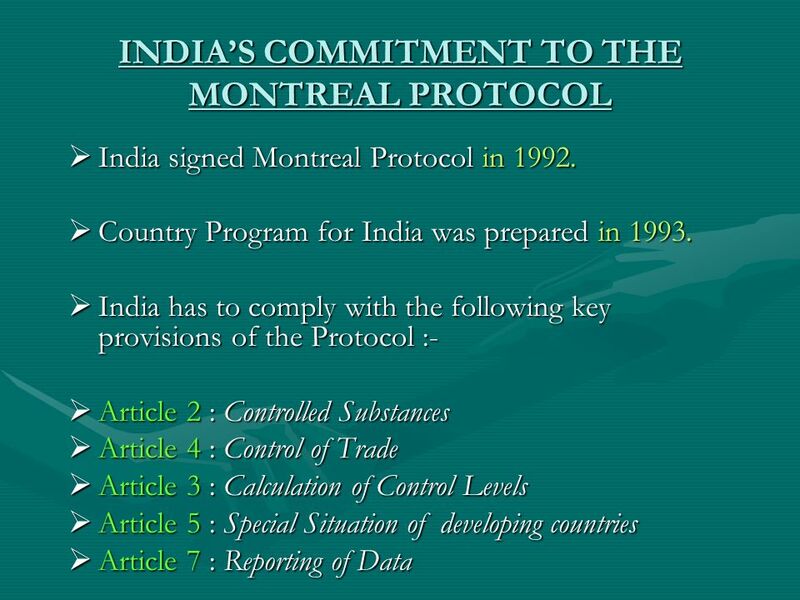 17th September 1992 : India became a Party to the Montreal Protocol. 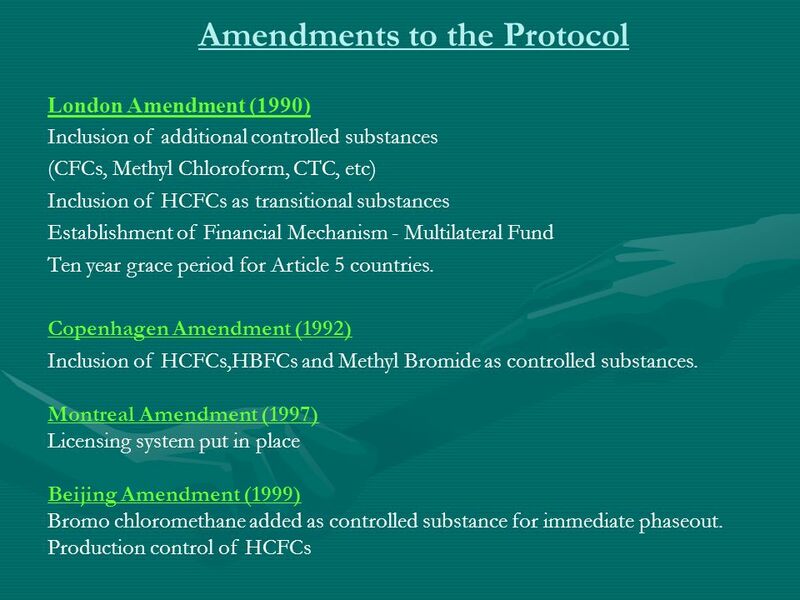 March 2003, ratified the Copenhagen, Montreal and Beijing Amendment. 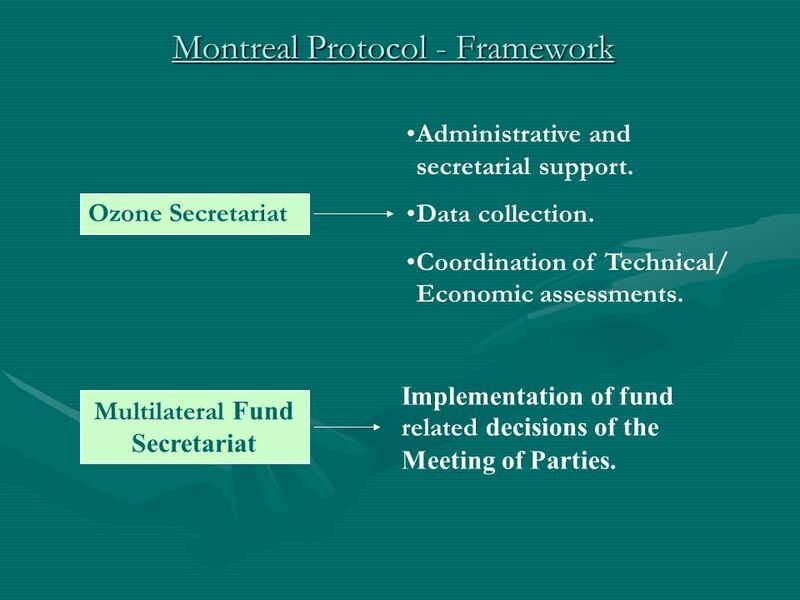 5 Montreal Protocol - Framework Multilateral Fund Secretariat Ozone Secretariat Administrative and secretarial support. Data collection. Coordination of Technical/ Economic assessments. 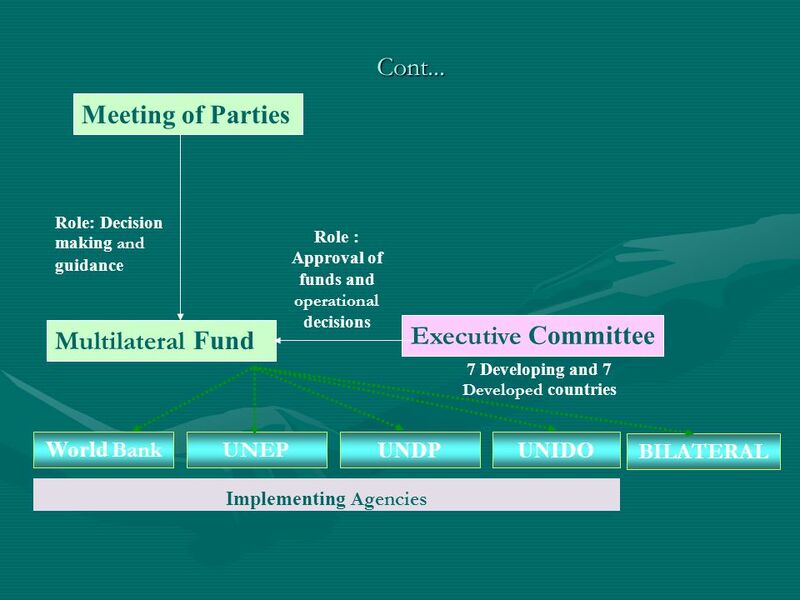 Implementation of fund related decisions of the Meeting of Parties. 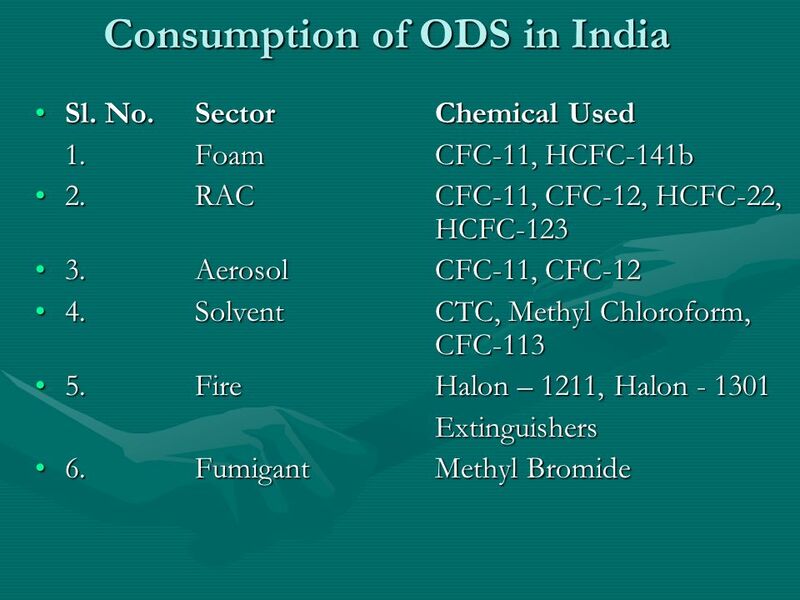 8 Cont… As an Article 5 country, India needs to phaseout production and consumption of ODS as per schedule specified in the Protocol. As an Article 5 country, India needs to phaseout production and consumption of ODS as per schedule specified in the Protocol. 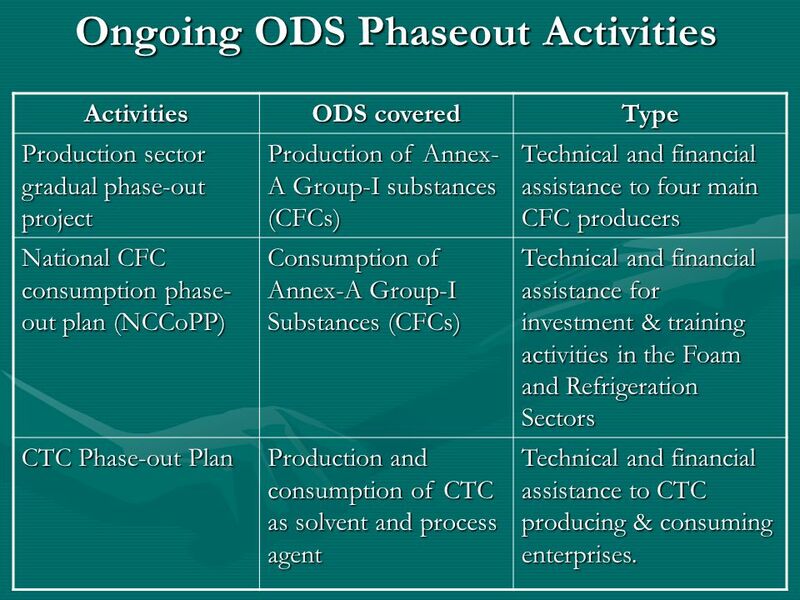 As an Article 5 country (developing country), India has 10 years grace period and also eligible for financial and technical support from the Multilateral Fund to phaseout production and consumption of ODS. 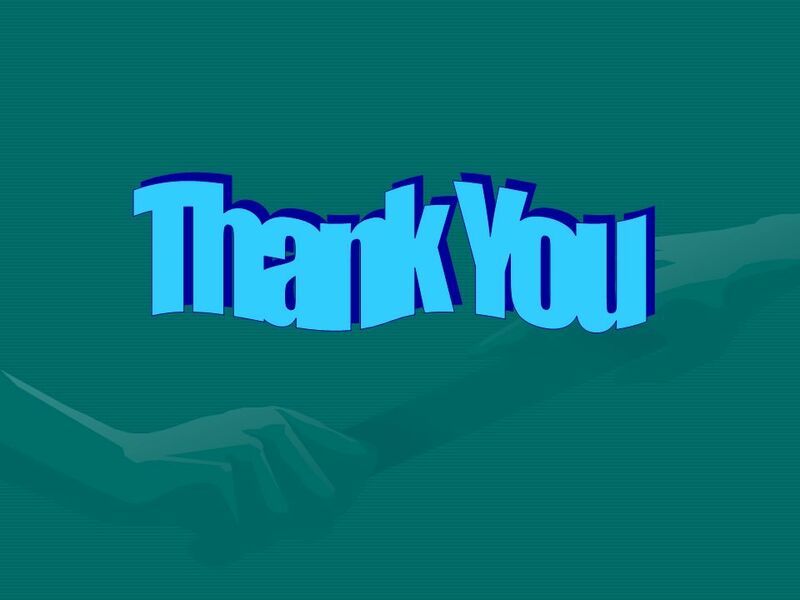 As an Article 5 country (developing country), India has 10 years grace period and also eligible for financial and technical support from the Multilateral Fund to phaseout production and consumption of ODS. 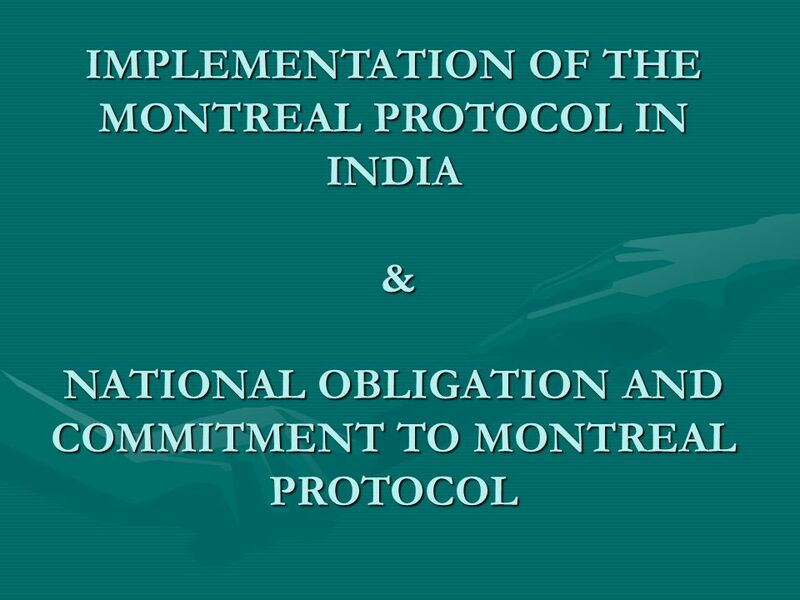 Download ppt "IMPLEMENTATION OF THE MONTREAL PROTOCOL IN INDIA & NATIONAL OBLIGATION AND COMMITMENT TO MONTREAL PROTOCOL." 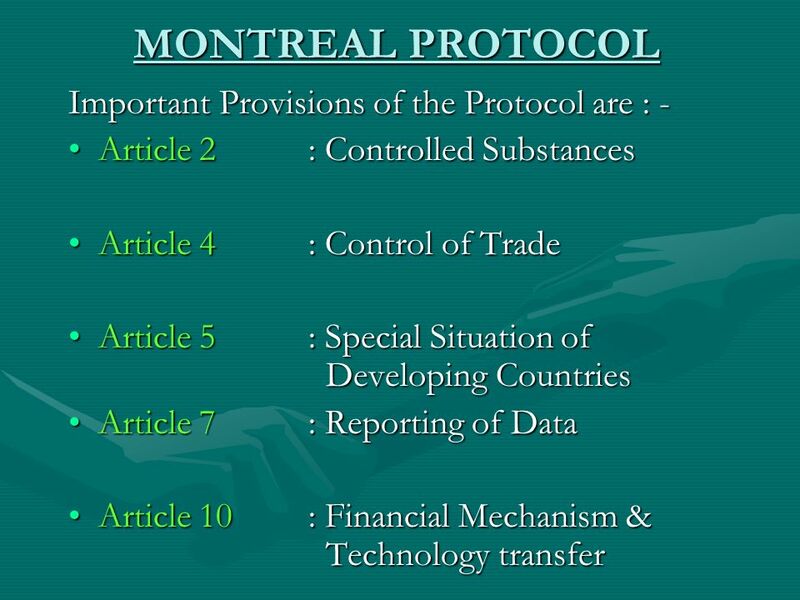 EXPEDITED PROCEDURE FOR AMENDING THE MONTREAL PROTOCOL PRESENTATION BY Mr. Alistair McGlone. United Nations Environment Programme Regional Office for Africa, Montreal Protocol Compliance Assistance Programme Readiness of A5 Countries for MB Phase-out. 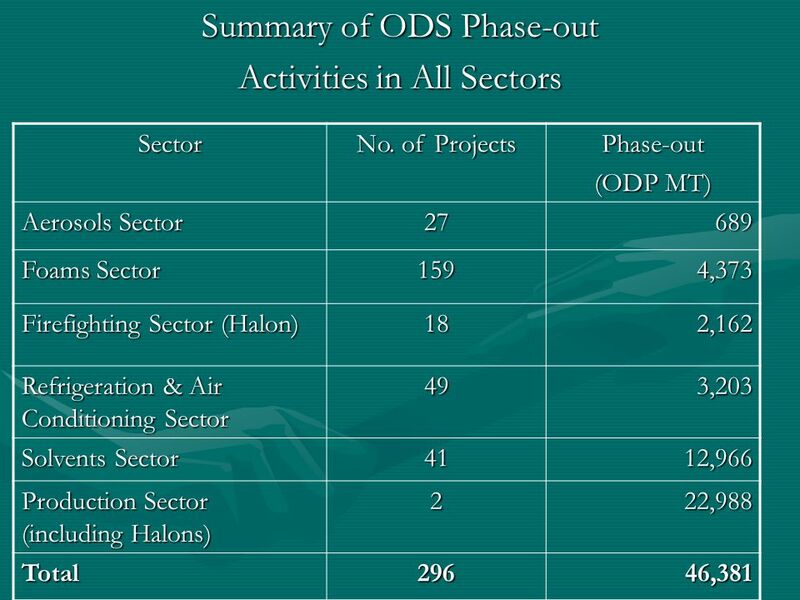 T E A P a n d T O C s - A s s e s s m e n t , M O P - 20, D o h a 1 The TEAP and TOC 2010 Assessment Reports Timelines and issues that will be dealt. 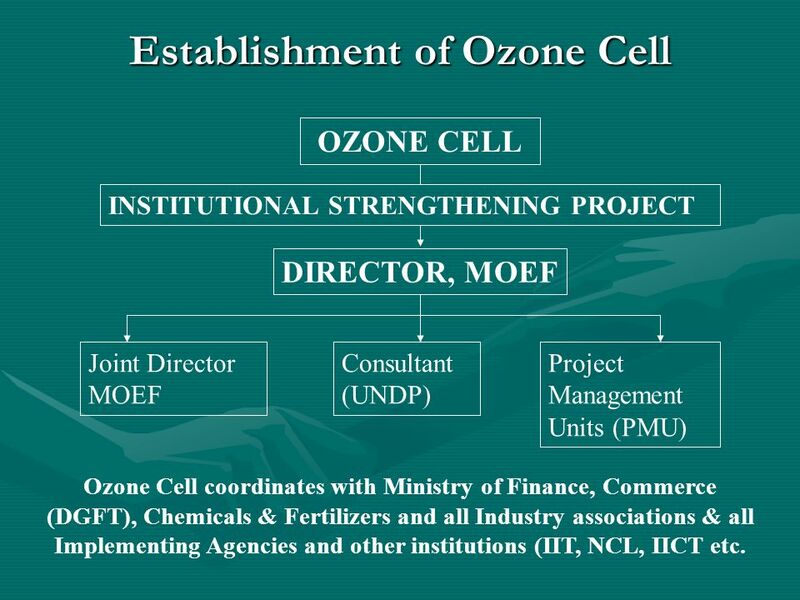 Considerations on a Facility to Finance the Climate Benefits of ODS Bank Management Seminar on the Environmentally Sound Management of Banks of Ozone-Depleting. United Nations Environment Programme Regional Ozone Network for Europe & Central Asia Compliance Assistance Programme Side event at 30 th OEWG CAP initiatives. 5.6 DEPLETION OF STRATOSPHERIC OZONE. the progression of the Ozone hole over the antarctic from 1970 to 1997. 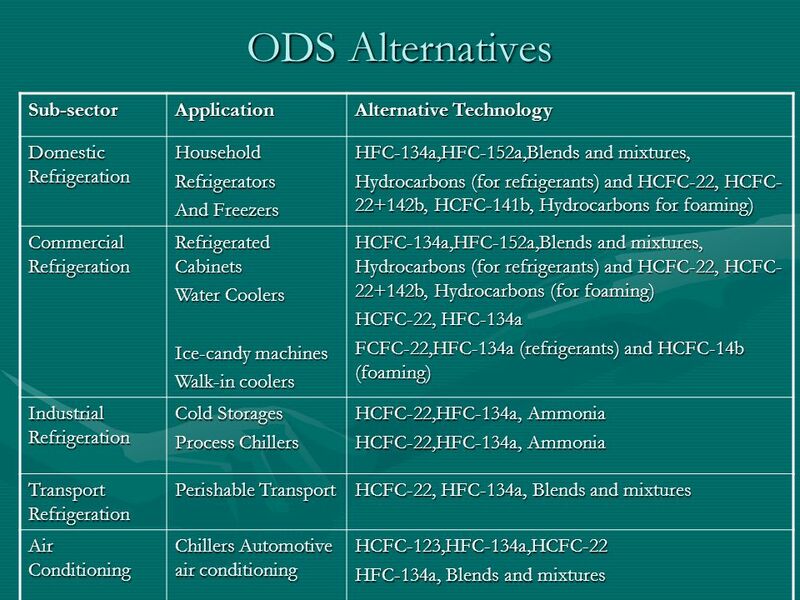 The Challenge: Moving Away From HCFC Refrigerants. 1 Global Change: Ozone Depletion Environmental Sustainability Educational Resources prepared by Gregory A. Keoleian Associate Research Scientist, School. PREMHANS JHUGROO MINISTRY OF ENVIRONMENT& SUSTAINABLE DEVELOPMENT REPUBLIC OF MAURITIUS HFC WORKSHOP UNESCO HOUSE PARIS. Protecting the Ozone Layer. Stratospheric Ozone Depletion Ground-level (tropospheric) ozone: harmful pollutant Stratospheric ozone: shields the Earth. The Ozone Story Presentation Ozone Secretariat UNEP. 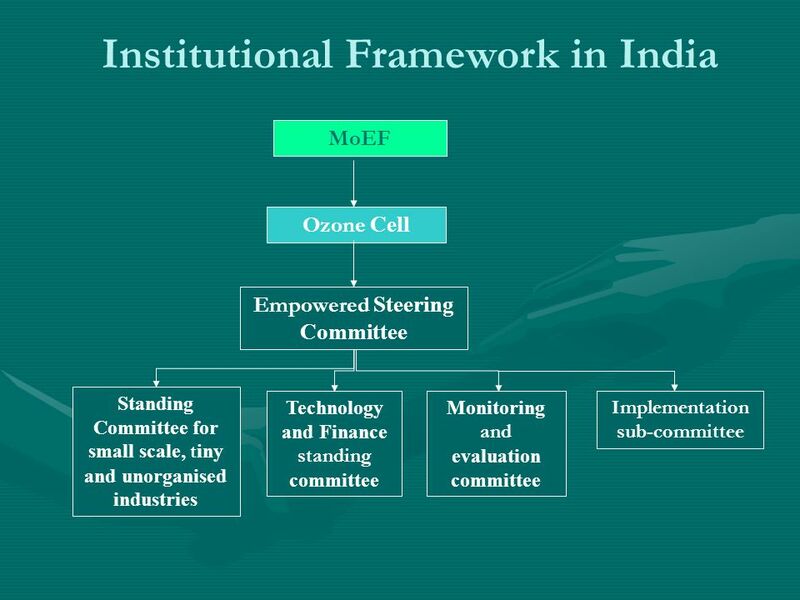 ROADMAP FOR IMPLEMENTATION OF HCFC PHASE-OUT IN INDIA OZONE CELL GOVERNMENT OF INDIA MINISTRY OF ENVIRONMENT AND FORESTS.